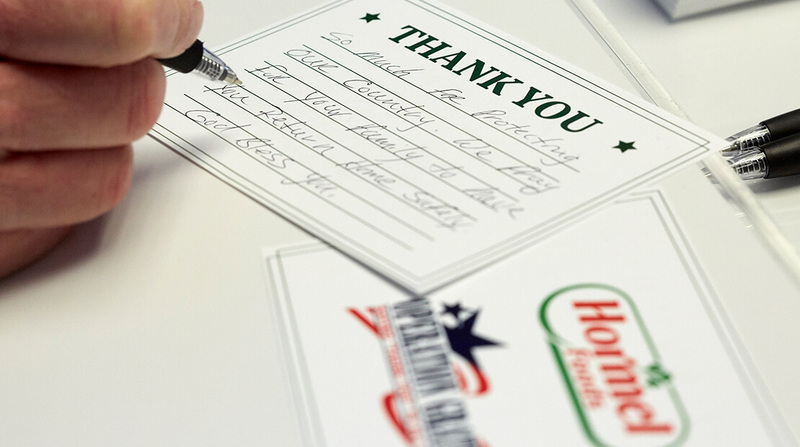 Hormel Foods Corporation (NYSE: HRL) announced today that it has partnered with Operation Gratitude and set a goal to send 52,000 letters of thanks to active duty service members overseas. Through its sponsorship with the Super Bowl Host Committee, Hormel Foods is using its activation space at Super Bowl LIVE presented by Verizon to have attendees write letters of appreciation to deployed troops. The thank you letters will accompany 52,000 care packages sent to active duty service members by Operation Gratitude. In addition to handwritten letters, the company has tablets and kiosks for people to send electronic thank you notes, and the activation space also includes a historical 1918 photo of Hormel Foods employees during a summer event. This photo includes the company’s founder, George Hormel, and his family along with the entire company staff holding signs about each department. One sign read “Stenographic department. We write letters to our troops,” further evidence of the company’s long-standing tradition of supporting our troops with letters of thanks. An online option is available for those who are not able to attend the activation space in person. Visit https://www.hormelfoods.com/operation-gratitude/ to complete a thank you letter form. Operation Gratitude, a 501(c)(3), volunteer-based organization, annually sends 250,000+ care packages to Veterans, New Recruits, First Responders, Wounded Heroes, Caregivers, and to individually named U.S. Service Members deployed overseas and their families waiting at home. Each package is filled with food, entertainment, hygiene and hand-made items, as well as personal letters of support. Operation Gratitude’s mission is to lift the spirits and meet the evolving needs of the Military and First Responder communities, and provide volunteer opportunities for civilians anywhere in America to express their appreciation to all who serve our nation. Each package contains donated product valued between $50 and $100 and costs the organization $15 to assemble and ship. Since its inception in 2003, Operation Gratitude volunteers have shipped more than 2 Million Care Packages.